CAISL students take the stage multiple times per year in our 450-seat Theater in the heart of the Fine Arts Center. The CAISL Theater also welcomes performances and presentations from community groups from Sintra and beyond. Take advantage of this exciting opportunity to “Reach for the Stars” by placing a dedication plaque with your personal message on a seat in the Theatre. 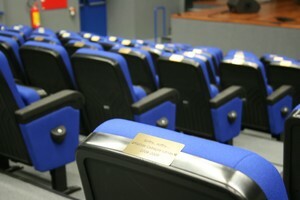 Donors may choose up to 50 characters (including spaces) to place on their plaques on as many as three lines. CAISL reserves the right to approve all messages. Seats will be allocated beginning with the front row center, working towards the back of the theatre. If you would like a particular seat, please ask at the Reception Desk to review the master seating chart.